We live in a Wikipedia society with plenty of information, yet we lack a proper framework for reality. Proverbs calls us to get wisdom, get understanding, and purse truth, all of which start with knowing who God is and why He created the world. Wisdom and understanding don't just bubble up from inside ourselves. No one goes to bed and wakes up with understanding. 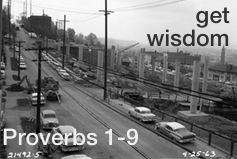 Wisdom must be both pursed and given from God Himself.